Your kids will enjoy making sun tea. Once they've learned how to make it, they can experiment with other flavors (peppermint, chamomile, lemon, and so on) and make iced tea all summer long! 1. Pour the water into a large 2 quart pitcher or jar (it should be about 3/4 of the way full). Drop your tea bags into the water. Close the top. 2. Place the pitcher in the sun for at least 6 to 8 hours. The sun will heat the water and steep your tea. When it's steeped, remove the tea bags from the pitcher. 3. Next, rinse 4 to 8 strawberries and set them on a cutting board. Slice them up with a picnic or paring knife. 4. Pour the apple juice into a measuring cup. Add the sliced strawberries. Stir in the honey, then pour the mixture into the pitcher of iced tea. Add a sprig of mint, if you'd like. Store for up to 5 days in the fridge. 5. When it's tea time, drop an ice cube into a tea cup. 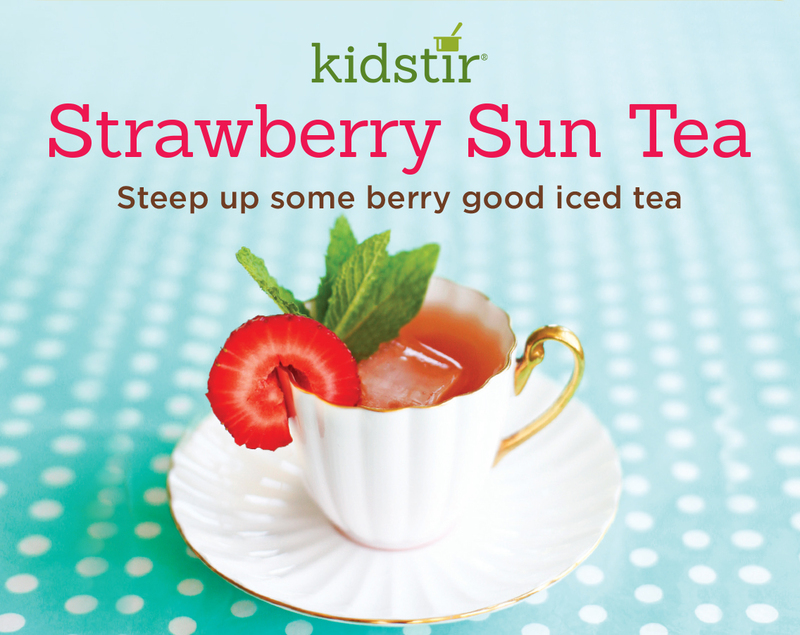 Set a small strainer on the cup rim, then pour in the Strawberry Sun Tea. Garnish with a strawberry and a mint leaf.